UP Playwrights' Theatre for its 25th Theatre Season brings the world premier of 2016 Gawad sa CCP Para sa Sining in Literature awardee Professor Emeritus Leoncio P. Deriada's "Distrito de Molo". It is directed by 2016 Gawad sa CCP Para sa Sining in Theatre awardee Tony Mabesa. Distrito de Molo will be presented in its original English version as well as a Filipino version that is translated by Palanca Award winner Allan Palileo. Distrito de Molo is set in one of the seven districts of Iloilo City called Molo formerly known as the Parian of Iloilo where most of the Chinese residents live. 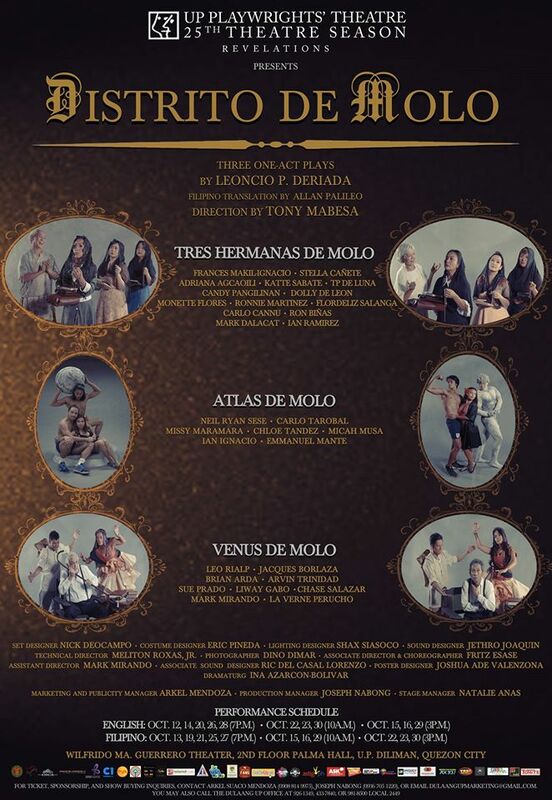 It is composed of three (3) plays taking place in three different timelines: Tres Hermanas de Molo, Atlas de Molo and Venus de Molo with each play showing the history, magic and the myths of the profound district. The first play has a setting during the late 1950s and revolves around the post-war lives of three wealthy unmarried sisters living at their stately mansion in Molo, all of whom carry a dark secret past. The eldest of the three Locsin sisters named Visitacion, accepts her faith from being unmarried seeing it as a penance for her past sins. While the other two sisters, Asuncion and Salvacion being discontented, has other thoughts in their minds. After revealing to each other their misdeeds and wrong doings, they call upon the ghosts of their past, asking for forgiveness and freedom from their burdens. Together with their very loyal nanny named Maura, they look forward for new beginnings of their lives. The second play, Atlas de Molo, is set in contemporary times. It is about two young newlyweds, Eric and Lorena Avanceña, who recently moved into the crumbling and rather deteriorating ancestral house of the Avanceña's in Molo. In the estate sits a garden with a dry fountain where the statue of Greek Titan Atlas stands. One night, the statue of Atlas comes to life and puts the Earth the he carries on his shoulder down and has a conversation with Eric. He taunts and provokes Eric to carry the Earth on his shoulder as a test of strength. What happens next will change their lives forever. The third play, Venus de Molo, is set in the 1930s, and revolves around the life of the wealthy and eccentric Don Guillermo Arroyo, who is rather obsessed of having his own “Venus de Milo.” He ask the service of a local sculptor, Crispino Marañon, to make a marble statue of “Venus de Molo” for him. But unknown to Crispino, Don Arroyo does not intend to pay any compensation for his services. The play has themes of: History, Identity, Hopes, and Dreams.